Sore points: Sikka's salary, high severance pay to executives, poor disclosures. 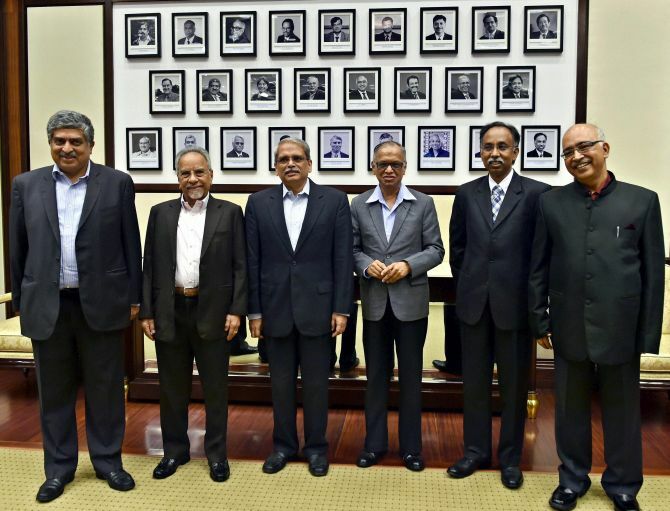 I Image: Infosys founders (from left) Nandan Nilekani, N S Raghavan, Kris Gopalakrishnan, N R Narayanmurthy, S D Shibulal and K Dinesh at Infosys headquarters. Photograph: Shailendra Bhojak/PTI Photo. The founders of Infosys have flagged concerns over transparency and corporate governance at the second-largest software exporter in the country. They have questioned the compensation package of Chief Executive Officer Vishal Sikka and the severance package to its former chief compliance officer David Kennedy. The current projections are contrary to how Murthy built the company, with his mantra of “under promise, over delivery”. Murthy and the five founders had stepped down as promoter-shareholders to ensure that their influence over the company reduced after they moved away from executive roles. Since taking over as CEO in June 2014, Sikka has pushed the company to adopt design thinking, brought in automation and invested in artificial intelligence platforms, anticipating a shift in customer spending from traditional services to cloud. The shift in culture towards a less-people more-software-driven business approach also has seen several executives quit. It includes former chief financial officer Rajiv Bansal and Kennedy, who resigned on December 31. “There is a question mark on disclosures. Infosys was a gold standard in corporate governance. It doesn’t have that premium now,” said a person familiar with the developments. Since Sikka took over as the company’s first non-founder CEO, several questions have been raised at Infosys that, analysts say, have not been answered satisfactorily. “We have been seeing non-transparency in corporate governance at Infosys. The company has not given a clear reason behind the severance package offered to former chief financial officer Rajiv Bansal. On the other hand, general counsel David Kennedy had to let go without any notice and it seemed as if he was sacked,” said Shriram Subramanian, founder and managing director of proxy advisory firm InGovern. “The appointment of D N Prahlad on the board is debated as he is actually non-independent and N R Narayana Murthy’s relative. Infosys’s behaviour for the last two years has been non-transparent,” he added. An Infosys spokesperson refused to comment. Infosys is not the only information technology services firm where shareholders have raised concern recently. Elliott Management Corporation, which holds a 4 per cent stake in Cognizant, has asked for higher value at about $80-90 per share by the end of 2017. Last year, promoters of Infosys had abstained from voting to give an extension to Sikka for another two years. The extension also came with an increase in compensation. “It may be justifiable for big company such as Infosys. But the company has not disclosed the performance metrics for him against his high package. What worked for the founders 10 years ago might not work today. They should view the operations from professional point of view,” said Subramanian of InGovern, pointing that Sikka’s compensation has to be comparable to peers at rival firms.